The KitchenLab is a true atelier of food possibilities. It is an experimental kitchen lab with all that is necessary for the design, handling and preparation of food, framed in a research center equipped with the most advanced scientific resources in the areas of chemistry, biology, physical and sensory analysis, dedicated to food science and technology and human nutrition. With professional equipment and finishes, the KitchenLab is perfectly sized and designed to frame teaching, experimentation, research, development and innovation related to food and nutrition. 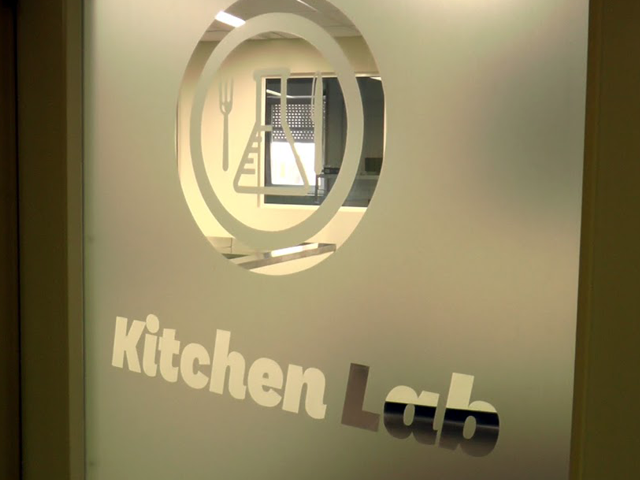 The KitchenLab is a space for learning and experimenting new and traditional cooking techniques, exploring the potential of ingredients and research and development of new food products, based on scientific knowledge. On the other hand the space invites you to discover science and technology that exists in a familiar space as the kitchen and to understand the physical, chemical and biochemical processes inherent to different stages of food confection and design proposals adjusted to the challenges of human nutrition. It has an important place in the various components of courses sponsored by the Escola Superior de Biotecnologia – Universidade Católica Portuguesa (ESB-UCP), as a stage of learning and experimentation. It also provides crucial support to several research lines and projects at the Centro de Biotecnologia e Química Fina (CBQF) - the Associate Laboratory and recognized Research and Development Center of the same institution. It is intended that the KitchenLab be considered an essential resource for professionals of all branches and dimensions in the various borders in the food field.